The Lives of Angels is a unique, thought-provoking vision of heaven and its inhabitants. For decades after his experience of spiritual awakening, scientist and theologian Emanuel Swedenborg visited the afterlife and wrote firsthand accounts of what he saw there. Scattered throughout his writings are descriptions of how angels live—their homes, their communities, and even their romantic relationships. The Lives of Angels brings his most striking insights into these heavenly beings together in one compact volume. The introduction by Grant Schnarr helps readers dip their toes into Swedenborg’s spiritual world, framing Swedenborg’s vivid, compelling recollections of things seen and heard in other realms. 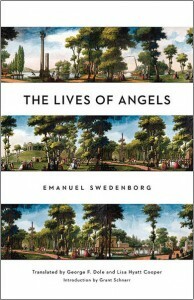 Learn more about Swedenborg’s vision of how angels live, love, and watch over us. Emanuel Swedenborg (1688-1772) was a Swedish scientist, nobleman, and theologian who spent his life investigating the mysteries of the soul. Between 1743 and 1745 he began to have visions of heaven and hell that resulted in a stream of books about the nature of God, the afterlife, and the inner meaning of the Bible. He devoted the last decades of his life to studying Scripture and presenting his own unique theology to the world. George F. Dole holds a BA from Yale, an MA from Oxford, and a PhD from Harvard. His recent translations for the New Century Editions of Swedenborg’s Heaven and Hell, Divine Love and Wisdom, and Divine Providence have won critical acclaim. He is also the author of Freedom and Evil, Sorting Things Out, and A Book about Us. He lives in Bath, Maine. Lisa Hyatt Cooper is translator of the fifteen-volume Secrets of Heaven for the Swedenborg Foundation’s New Century Edition of the Works of Emanuel Swedenborg. Her past publications include a Latin edition of Swedenborg’s work Other Planets. She lives in Bryn Athyn, Pennsylvania. Grant Schnarr is the author of Ghost Brother Angel, The Guardian Angel Diary and several books about growth and spirituality, including The Art of Spiritual Warfare. His book You Can Believe! is a best-selling introduction to Swedenborgian thought.